An integral component in cable management, the cable ladders available here at DP Building Systems have been industry favourites for those throughout the building and electrical trades for as long as we can remember. Utilising a comprehensive system of slotted structures, our U10 cable ladders, U12 cable ladders and U15 cable ladders provide a range of support options. Available in widths of 150mm to 900mm and lengths of 3m or 6m, our cable ladders ensure an excellent level of support can be given without the need for drilling so you can save time, money and maximise the quality of finish. 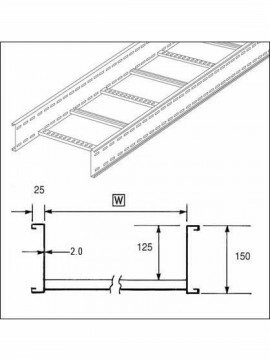 Other widths are also available and are made to order, whilst the standard finish for all cable trays is hot dip galvanised. Offering complete stainless cable ladder systems is what we do here at DP Building Systems, and since our inception in 1998, we have delivered a wide range of cable management solutions for projects big and small. From our Birmingham based headquarters, our specialist team work to ensure you can guarantee the very best quality throughout your own client base with cost effective solutions that not only meet but exceed your customers’ expectations. In addition to providing U10 cable ladders, U12 cable ladders and U15 cable ladders, we are also renowned for our bespoke cutting services, which are available on-site at both our London and Birmingham branches. Whether you are looking for a specific length of stainless cable ladder or would like a channel or tray cut to size, we can assist. As a specialist distributor, we have worked with professionals and organisations throughout the building service industry to ensure the most complex support requirements can be fully catered for. Are you looking for assistance? Browse our selection of stainless cable ladders today, or contact us direct on 0121 706 7777.